LITE Seed grants - due June 1, 2019! The next round of LITE Seed Grants is fast approaching – applications are due June 1, 2019. Funding for the LITE Seed Grants has increased from $5000 to $7500 as of January 2019. Along with the increase in funding comes a new requirement - in order for your application to be considered, applicants are required to meet with Kyle Scholz or Kristin Brown within the first three weeks of the term in which they are applying. For the June round, this meeting must occur by May 21, 2019. At this meeting, we will discuss your project proposal and research plan, and suggest ways to enhance the quality and clarity of the application. If you are interested in learning more about teaching and learning research, we encourage you to join us for the Designing Teaching and Learning Research (CTE 6759) workshop on Thursday, May 9, 2019 from 10:00am-11:30am. Learn more about the LITE Seed Grant process and how to submit an application. Teaching & Learning Conference 2019 program available; registration closes April 11! We're pleased to announce the 2019 Conference Program is now available! The registration deadline for the Teaching and Learning Conference (April 11, 2019) is quickly approaching! 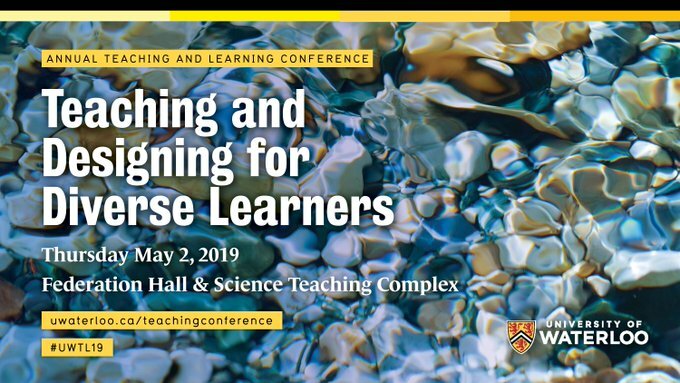 Please join us for our 11thannual University of Waterloo Teaching and Learning Conference taking place on May 2, 2019 in Federation Hall and Science Teaching Complex. Our 2019 conference theme is Teaching and Designing for Diverse Learners. To register and see faculties, departments, and units covering registration fees, please visit the Conference Registration webpage. Last year saw over 330 faculty members, staff, and students gather to learn from and with one another around the theme of motivation in teaching and learning. This year, we are excited to welcome Allison Lombardi, Associate Professor in Educational Psychology at the University of Connecticut, as our keynote speaker, as well as Drs. Carol Hulls (Continuing Lecturer, Mechanical and Mechatronics Engineering) and Markus Moos (Associate Professor, School of Planning) from Waterloo, who will each recreate a successful instructional approach in our Igniting Our Practice plenary session, which showcases some of the excellent teaching being done on our campus. The registration deadline is Thursday, April 11, 2019. Congratulations to the recipients of the 2019 Teaching Awards! LITE Grants in the News! A Learning Innovation and Teaching Enhancement (LITE) Seed Grant awarded to Wade Wilson (Kinesiology) and Nicole Westlund Stewart (Writing and Communication Centre) was featured in the Waterloo News. Researchers studied the integration of mindfulness techniques in a large classroom and made recommendations for enhancing practice. 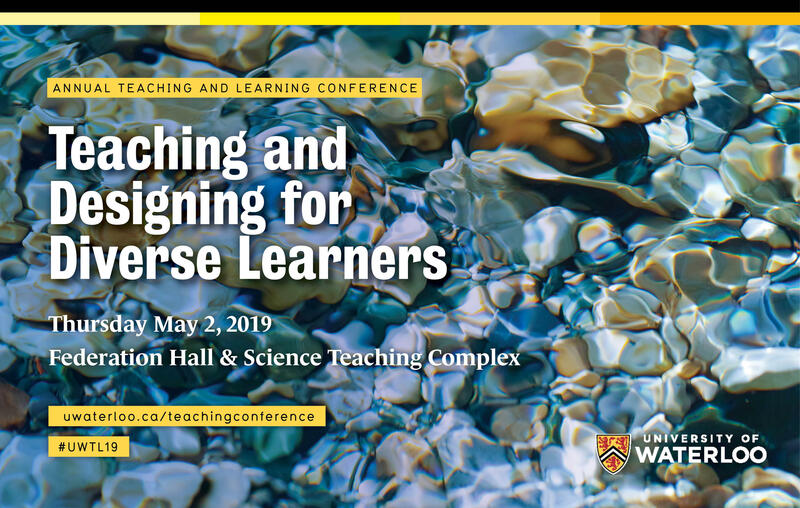 We are pleased to let you know that registration is open for our 11th annual University of Waterloo Teaching and Learning Conference taking place on May 2, 2019. Last year saw over 330 faculty members, staff, and students gather to learn from and with one another around the theme of motivation in teaching and learning. Our 2019 conference theme is Teaching and Designing for Diverse Learners. The Office of the Associate Vice President, Academic and the Centre for Teaching Excellence are pleased to announce the recipients of this term’s Learning Innovation and Teaching Enhancement (LITE) Full Grants. As of January 1, CTE is using a new training and development registration system called GoSignMeUp. The new system has many advantages over the old system, both for individuals signing up for workshops and for CTE's workshop administrators. We are pleased to announce that funding for the LITE Seed Grants has increased from $5000 to $7500 as of January 2019. Along with the increase in funding comes a new requirement - in order for your application to be considered, applicants are required to meet with Kyle Scholz or Kristin Brown within the first three weeks of the term in which they are applying. This meeting must occur, at the latest, one week prior to the submission deadline. At this meeting, we will discuss your project proposal and research plan, and suggest ways to enhance the quality and clarity of the application. 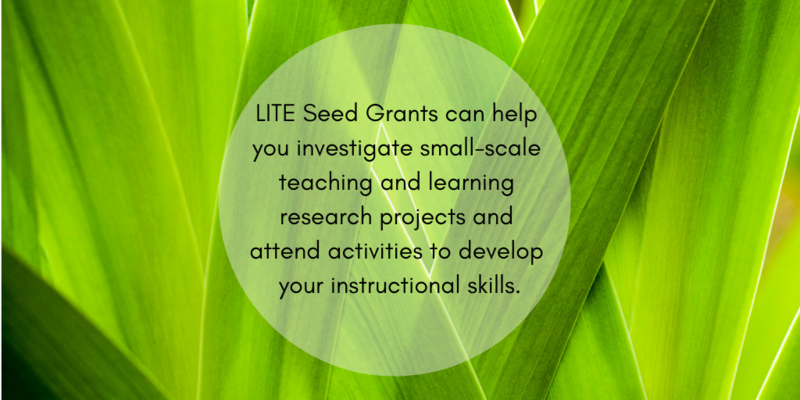 As a reminder, the next round of LITE Seed Grant applications are due February 1, 2019. If you are interested in learning more about teaching and learning research, we encourage you to join us for the Designing Teaching and Learning Research (CTE 6759) workshop on Tuesday January 15, 2019 from 12-1:30pm. 2019 Teaching and Learning Conference Call for Proposals Now Open! The Call for Proposals for the 2019 University of Waterloo Teaching and Learning Conference is now open! Our 2019 conference theme is “Teaching and Designing for Diverse Learners”. We invite you to submit proposals for presentations, panel discussions, workshops, and poster presentations that share your practices and research related to inclusive education. The deadline for proposals is January 23, 2019.